When the temperature and the water levels drop, look for reds packed into tight schools in deeper cuts and dead end canals. Position yourself in the middle, and slowly work your bait up the ledges to find where they are holding. 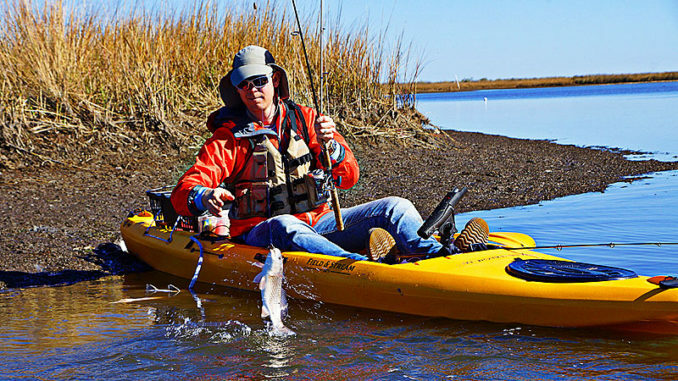 For Louisiana’s kayak fishermen, January and February are generally the most dreaded months of the year. It’s miserable outside, the wind is blowing and your significant other is looking to cash in on those long-delayed honey-dos. The cold, dreary days and low expectations keep most fishermen off the water, and make excuses to put off odd jobs around the house harder to come by. However, by closely watching the weather, kayak anglers can pick their days and actually still have a safe and productive trip. First and foremost is safety. Being cold and wet is a recipe for disaster. Make sure to dress appropriately and keep your PFD on. Delacroix, while generally known for good bass and redfish action close to the launches, can also provide fantastic cold-weather trout bites once specks have moved deep into the marsh. The fish are more predictable, and what many consider a slow time can really produce some good fishing. Delacroix has a mix of shallow lakes, bays and ponds that are interconnected with deep natural bayous, man-made pipelines and dead-end canals. This diverse habitat provides areas for fish to congregate and feed — no matter the water temperature. Like many areas of Southeast Louisiana, winter cold fronts driven by strong northwest winds send water racing out of the Delacroix marsh. But the shallow draft of a kayak still allows you to get to the deeper areas where fish necessarily have to congregate. In addition to the uncomfortably cold conditions and low water, you may also have to deal with howling winds and water the color of chocolate milk. Frequent cold fronts interspersed with days of sunshine and warming temperatures have the fish moving back and forth between deeper and shallower areas. It only takes a small change of two to four degrees of water temperature to move the fish and turn on their feeding instinct. Spinnerbaits are effective for bass in the winter when slow-rolled along deeper edges and cover. 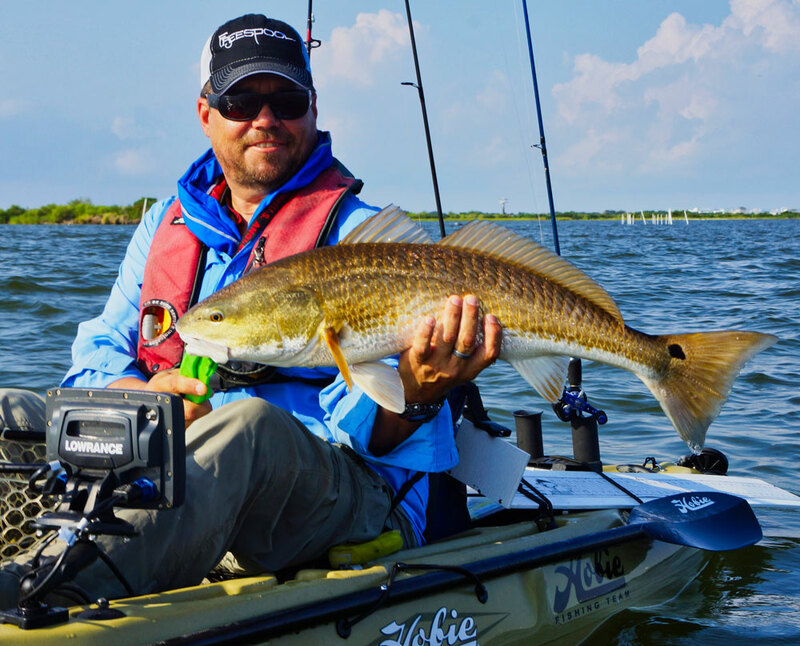 A depth finder with a water temp gauge can be an invaluable tool for winter kayak fishing. The mistake many fishermen make is leaving an area that is seemingly devoid of fish. If you are not catching anything in the middle of a canal, move closer to the bank or more toward the mouth. Subtle changes in temperature, level of sunshine or water movement can be the difference between a skunk and a full bag. 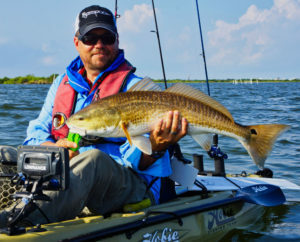 Delacroix is a vast area that provides fishing opportunities under almost any conditions, however, kayak anglers are somewhat limited by range. So you need to interpret and adapt to the conditions presented on any given day. When the water temperature is between 50 and 55 degrees, fish will likely be staged on the ledge of a drop off. When it drops below 50 degrees, they will be a little deeper — toward the bottom. Use the depth finder to find these ledges and deeper holes. The fish generally stage where they can easily move deeper if the temperature plummets, or where they can head for the surface if it warms up. Fish an area thoroughly because you can literally miss the bite by a difference of only several feet. If the day warms, the fish are likely to work their way onto nearby flats. The only live bait usually available in winter is cocahoe minnows, and they are productive for trout, reds and bass. However, one hallmark of winter fishing is that plastics typically shine. No matter what bait you choose, fish it slowly and be cognizant of subtle winter bites. The slightest change in feeling may actually be a bite, so when in doubt always set the hook. 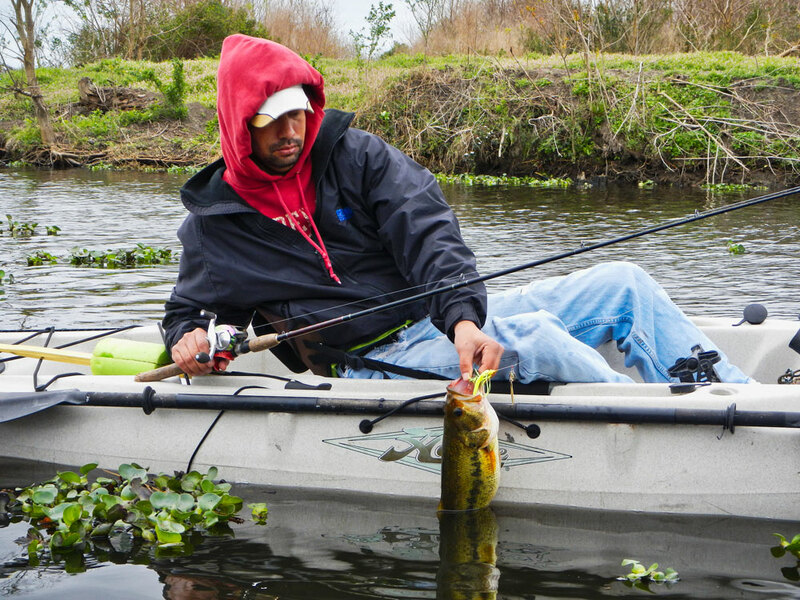 The cold water slows the fish, and you need to do the same with your bait. Even subtle rod movements can pull the bait away from lethargic wintertime fish. If the fish are settled into deeper water, tight-line the bait along the bottom, or drift with a line out the back of the ‘yak. 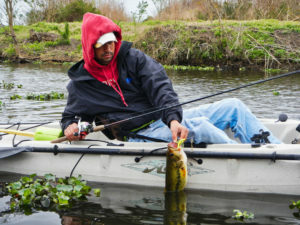 If they are staged a bit shallower or have moved onto the flats, dangle your bait under a popping cork as the bite will be a bit more aggressive. One good thing about winter fishing is that there is generally no need to head out at the crack of dawn. Let the water warm a bit, and don’t shy away from midday trips. 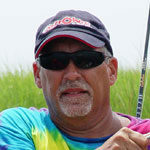 Delacroix offers an easy mixed bag of trout, reds and bass — all in the same area, using the same lure. When anglers in other parts of the country have put away their kayaks for the winter because the season is closed or the lake is a block of ice, Louisiana ‘yakers can still safely enjoy some hot fishing action. How: This decades-old lake within the state park is nearly 2,000 acres, and has three different boat launches that provide kayak anglers easy access to all sections of the lake. The man-made lake was impounded in late 1942. And while Chicot is not known for abundant catches, large bass are regularly taken — and this time of year sees less angling pressure. The lake record is more than 13 pounds. The park can be used for day access, but cabins, lodges and both improved and primitive camping sites are available for rent. Rat-L-Traps or other silver crankbaits worked slowly near the mouths of creeks can entice lethargic bass. Plastic worms rigged Texas- or wacky-style are also a good bet. Live shiners are great for dropping into tightly bunched schools of white perch, which will be holding in deeper water. Use a depth finder to find where and what depths they prefer that day. Chicot is a beautiful lake for ‘yaking and catching, with many areas of flooded timber. With good weather and a few days exploring, you should be able to locate where the bass are holding. Launch: There are three launches within the park that provide access to the myriad of coves, fingers and open water areas. Park Entrance: 3469 Chicot Park Road, Ville Platte, La. Insider tip: Talk to friendly locals at the ramps to get pointed in the right direction. Pick good weather days in January, and Delacroix can provide plenty of action close to the launches. How: The area offers a blend of shallow marsh for action on warmer days when the fish move up, and deeper bayous and pipelines where they seek refuge when it is bitterly cold. The thick grass of summer has subsided, and the trout have moved into the marsh during their winter pattern. Live bait may be available at the local marinas, but usually isn’t necessary. Plastics tight-lined or popped under a cork generally do the trick. If it is cold, look for the deep canals and deadend pipelines not far from the launches. Slowly work jigheads/plastics on the ledges. Position the kayak where you can work the bait down off or up onto the ledge, depending on where they are holding. Spinnerbaits and plastic worms are also effective if worked slowly. Any cast is likely to yield a trout, red or bass — all in the same spot, and all on the same lure. Insider tip: Duck season is open in the area through Jan. 20. Delacroix is a popular duck hunting area, so keep a watchful eye out for duck boats and give the hunters a wide berth if you come across them set up in a pond. Camps, rooms and cabins are available throughout the area — just ask the marina owners for recommendations.